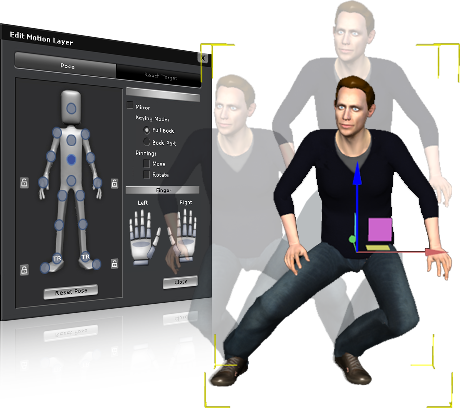 iClone5 allows you to create in-house animations by simply moving your body in front of any Kinect Motion Capture system. You can easily customize a variety of daily motions by using the motion puppet and MixMoves system! iClone5 enables characters to interact realistically with their environment or even other characters. Also included are real-time physics, toon rendering and many other shader effects that will bring you to the next level of professional movie-making. The MixMoves (motion graph) system consists of hundreds of well-calculated, daily motions for top mocap quality. The system automatically generates natural transitions between previously selected motions for male or female actors. Its motion graph technology presents a general framework for human motion states to blend together, seamlessly. Storytellers simply need to select target motions under different states such as standing idle, sitting, kneeling or lying down. It then automatically sequences motions and blends them together in a natural, believable manner. You may use a mouse or any other handheld device to create an unlimited number of motion variations to reflect your character's personality. 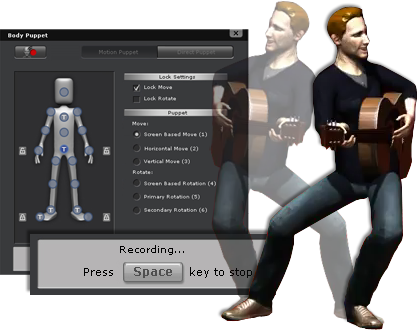 Users may select body parts and add puppet behaviors while they control their animations during playback or real-time recording. 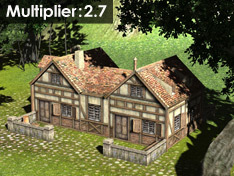 You may also manually control the puppeteering speed and direction, or let the animation loop with slider alterations. Animators are now able to create frequent motion alternatives with 55 different male & female puppet profiles found in 4 categories. Licensed from Autodesk®, the same core technology of Motion Builder for human motion control; iClone5 meets the highest standards of human bone structure and motion editing systems. Using Human IK as the core character engine allows your 3D characters to now have automatic floor contact while the intuitive real-time IK motion control keeps a proper body balance. Props also have motion controls with flexible motion adaptations such as holding a gun with both hands, or advanced person-to-person interactions such as shaking hands. Puppeteer your characters and record the animation progress in real-time with the motion editing controls. iClone5 also incorporates a comprehensive new IK engine that allows you to pin body parts to certain locations, while allowing you to move characters naturally or use iClone to animate the rest of the body for you. 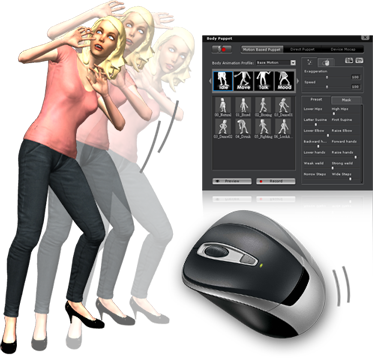 Use a mouse to freely control the movement, rotation, or scale of a prop and record its animation in real-time for authentic movement. 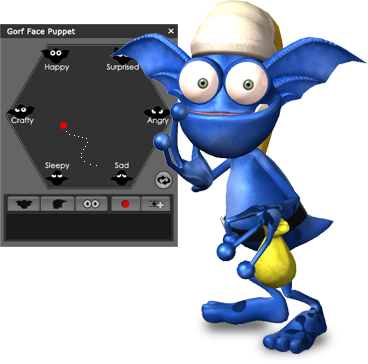 With the Prop Puppet panel you will be able to simulate different object movements by using prop animation profiles to further customize movement, rotation or scale; with different X, Y, Z parameters. By default the playback speed of each motion or animation clip of a character, or iProp, is linear. However, you are allowed to alter the clip into different dynamic speeds which changes the overall speed of the motion within the clip. iClone5 provides a better motion management system that well organizes your animation clips. 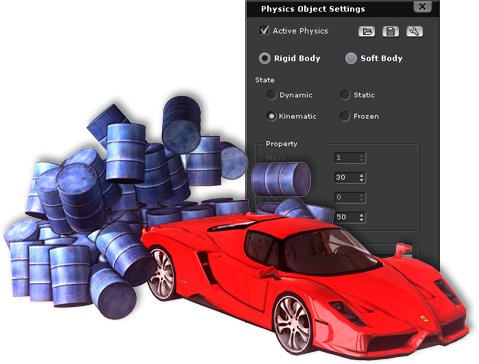 Rigid body dynamics enable you to simulate objects with a high degree of realism such as fall, collide and bounce. All these movements are controlled by physics properties such as mass, elasticity, friction, damping, impulse, collisions, constraints and others. 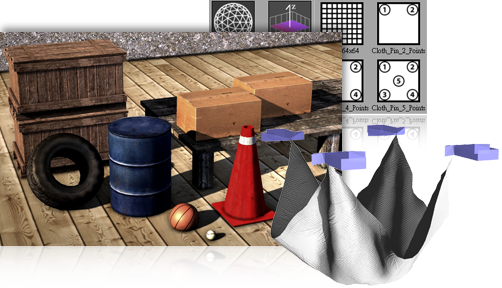 You may even add rigid body physics to any prop or character in order to add another dimension of interactivity between subjects. Soft body dynamics focus on realistic physical simulations that deform whole objects and singular planes such as clothes. Animations are now incredibly life-like as objects can accurately represent their elastic properties like rubber, squashed balls or jelly puddings. You may even simulate cloth effects, from a singular plane, with different material stiffness such as silk, linen or any other materials that will be affected by air resistance. With the smart physics engine you are now able to correctly simulate formulas and concepts for use in math, physics, astronomy or any other real-world applications. With the live Prop Puppet controls and interaction, you can easily develop prototype games with marbles, pinballs, bowling balls and others. 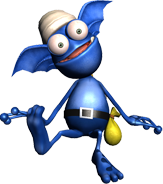 Cartoon rendering and cell shading allows animators to create a flat-looking 3D image with a cartoonish look, typically exemplified in artistically animated movies. With enhanced post FX rendering options, iClone5 users can render and create key-able visual effects like blur lens, sketch or black & white. 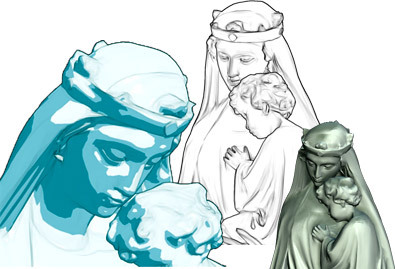 This allows for a wide range of amazing post effects that transform any 3D animation into top-notch, studio art motions. 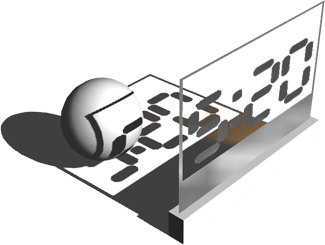 The Light Multiplier enlarges the range of brightness of lighting effects. 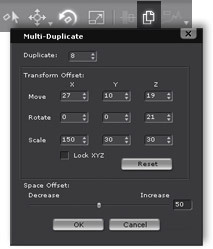 This multiplier provides room for an artist to turn ordinary animations into uniquely stylish ones. The camera gizmo and the PIP view turn iClone5 into a professional photography & film studio. The camera gizmo allows you to easily control multiple cameras with visible positions, while providing you with a clear range of camera views and depths of field. You may then use the PIP view to observe your subjects between preview and custom camera mode. 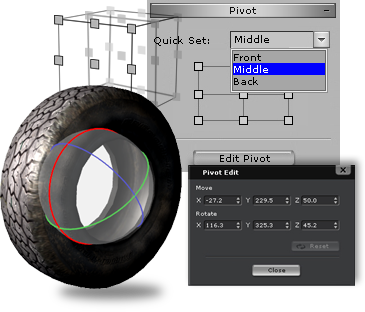 The fully flexible Pivot Editing system allows you to assign different object positions as pivots, so that you can easily create rolling wheels or rotating doors. 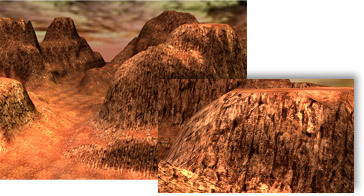 The height map terrains inside iClone5 are five times larger, and have faster loading times than in previous versions. With the enhanced detail maps, you may now enjoy high quality visual performances when zooming in and out. 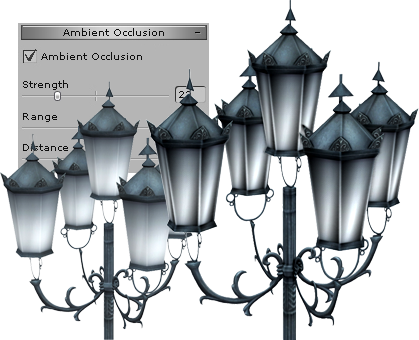 To lower the performance demands of your PC, iClone5 now calculates duplicated objects as one single object, significantly improving the real-time experience. 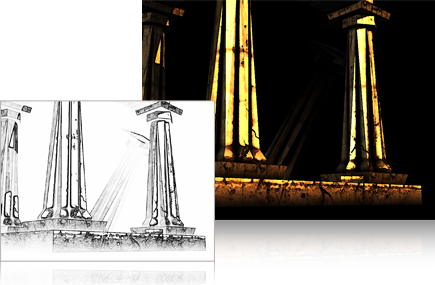 Alpha Threshold uses the opacity texture to trim props. Shadows will then be altered as the prop changes look. Although the shadow result may look the same as the Shadow Threshold does, the prop appearance will actually be different. Enhance the loading speed of projects with high polygon counts. 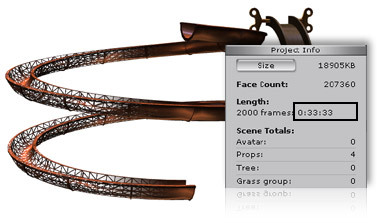 Now loading projects is 5~10 times faster, thanks to iClone5's new optimized calculations. 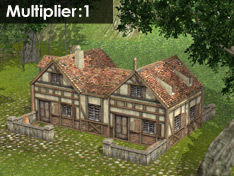 iClone5 provides features for easily aligning objects such as props, accessories and trees. You may also space objects with a fixed distance. This is useful when you need to re-locate scattered objects in order. 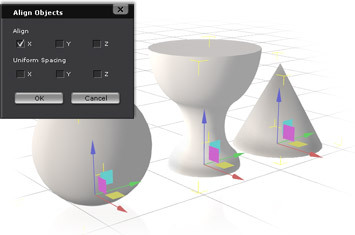 By activating the "Snap to Model" function, you may now easily snap objects together to assemble walls of a room, match a frame on the wall, or set up an entire pyramid! 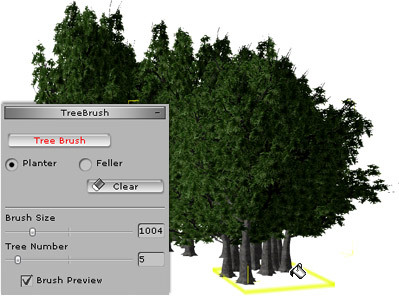 With the same feature as grass brush, now you can easily plant your trees with tree brush. This new iClone5 feature allows you to preview your gardening skills in real-time. 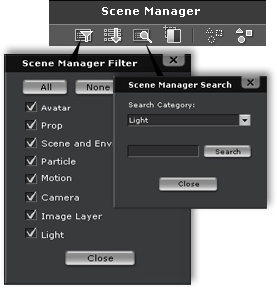 The enhanced scene manager allows you to filter out objects you do not wish to see. The new search function also allows for faster object access. In iClone5, you may choose to play back your projects in real-time or frame by frame. The new By Frame playback allows for better soft body physics simulation. The new generation of iClone characters provides a higher polygon count for head meshes which result in better facial expressions with natural head shapes. The new characters also contain 3D teeth for more realistic talking performances. IClone G5 characters have consistent motion bones for better motion controls. Additional chest bones can now emulate realistic breathing with proportional chest contractions. New cartoon characters like Gorf have the same character bones of other standard character which allow you to apply any motions, and make further IK/FK motion adjustments. In addition, the characters contain an advanced LUA script controller that allows you to puppeteer exaggerated facial expressions like eyelid rolling, pupil dilation and even ear rotation! To get you started with easy physics, iClone5 provides different types of soft clothes with different meshes and available pin methods. Use the Infinite Plane prop to generate a physics plane without edges, in order to avoid penetration issues. Smart iProp now adopt the new Lua (lightweight multi-paradigm programming) language for game-like prop interaction. 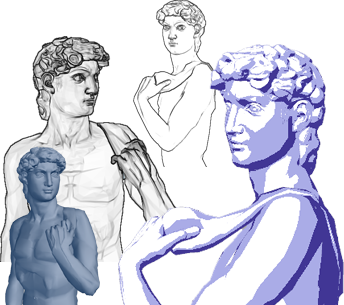 Lua is described as a "multi-paradigm" language, which is commonly used in many game companies. With Lua, you may easily manipulate an object with the use of a control panel. With the new post FX features inside iClone5, users can have a real, hands-on experience with visual possibilities that transform any dull project into amazing scenes. Make use of toon and visual effect templates like blur lens, color filters, and NPR (Non Photorealistic Rendering).